Summer is an online training and nutrition client located in Texas who wanted to lose weight and prepare for pregnancy in a healthy way. 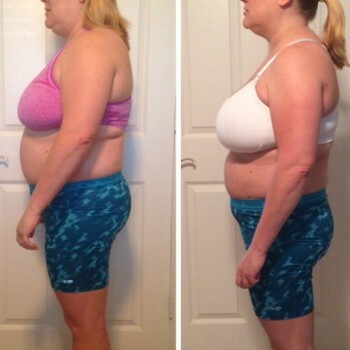 She had previously tried diets where you have pre-packaged meals, shakes, and restrictive meal plans to follow, and she wanted to learn more about how to eat for her goals without relying on this approach. A big thing for her was to have meals that were family friendly since she was also making meals for her husband and two boys. Summer had been taking a lot of group classes at the gym so she was familiar with those, but weight training was new for her. She jumped in right away and had lots of questions. I always appreciate clients who take an active part in their plans by asking questions, and I use it as a chance to explain why and how things are done. That way they can apply this knowledge later when I’m no longer with them. I was especially impressed at the way that Summer approached her nutrition. She began trying new foods and combinations. She listened to explanations about my approach and learned to not fear carbs. I remember shortly after she started there was a special anniversary dinner that she wanted to enjoy. We talked about things that she could choose, compromises like picking wine or dessert, and she was thrilled to have a great meal and not have it impact her goals. A couple months after starting with me, Summer got the great news that she was expecting. I adjusted her workouts as needed to accommodate how she felt during the first trimester. She and I kept in contact about exertion level, energy, hunger, and weight to ensure that we were on track along with following doctor’s orders. The doctor advised her to take a break partway into her pregnancy so Summer put her program on hold for a bit. I kept in contact with her and was amazed that she took everything she had learned and applied it on her own. 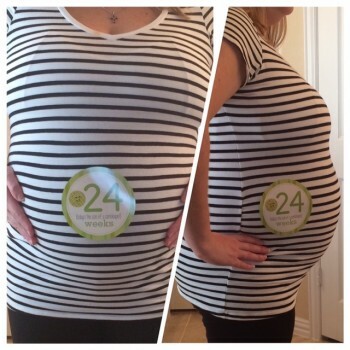 She enjoyed pregnancy, listened to her body, continued eating healthily, and ended up weighing less after she had her baby bug than she did when she got pregnant. I couldn’t be more proud of her. If I could shout my excitement about this from the rooftops, I would! Summer’s pictures show what is possible with a healthy approach to fitness and eating during pregnancy. The Before was taken at the beginning of her journey and the After was taken postpartum. The ultimate goal was to have a great experience and a healthy baby, but the fact that she was able to also maintain her progress is an added bonus. Summer is back to working with me on training and nutrition after getting the go ahead from her doctor and I can’t wait to finish our journey. Read what she has to say about working with me and the results she saw with her training and nutrition programming. 1. What’s something that you’d like me to start doing? I didn’t think online coaching would work for me, but my internal motivation has been powerful. I wasn’t sure if I would enjoy the workout routines. I thought having to count, measure, weigh foods was going to be hard. You gave me lots of advice, encouragement, and attention in order to maintain a more personal relationship through email. The workout routines have been a good challenge, and you incorporated things I liked, didn’t care for or had difficulty doing. Teaching me about foods, how to size portions, etc. made it easy for me to learn. Before I started with you I was seeing my primary doctor and a trainer with the Y about not being able to lose weight even though I was working out. I was referred to an endocrinologist. Before I went to that appointment, I started working with you and had already lost weight. I realized maybe it wasn’t something medically wrong with me but just how I approached losing weight. I took what I learned from you pre-pregnancy and applied it when we had to hold off on our sessions. I allowed myself to enjoy being pregnant, eat what I wanted, and do a lot of stretching and yoga moves. My baby was born at a healthy weight. I have kept off about 15-20 pounds since we first started together and weigh less 10 weeks postpartum than I did pre-pregnancy. Having gone through one failed IVF, I wanted to get healthier to possibly increase my odds of success the next time. I took a few months off from doctor visits, started working with you, and started treatment again about a month after seeing you. I can’t say why things worked this time, but they did. I felt better, my body was in better condition, and I do believe that exercising through the pregnancy helped. It’s not scientific, it’s just my personal feelings on things.